Published by Highways England Co. Ltd. 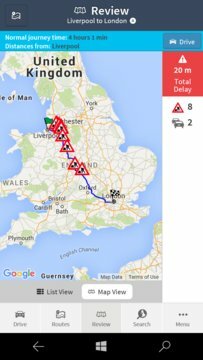 Check how the traffic is flowing on motorways and major A roads in England with official information live from the Highways England National Traffic Control Centre. PLEASE NOTE: This app only contains information about the roads we manage in England. Other smaller roads in England are managed by local authorities. Trunk roads and motorways in Scotland are the responsibility of Transport Scotland; those in Wales of the Welsh Assembly Government. This App will use your current location to give you the traffic news when and where you need it. Plan your journey, reduce congestion, lower emissions and arrive safe and less frustrated. Official data is collected from thousands of vehicle monitors, CCTV and patrol reports to show where Highways England network is flowing well and to keep you up-to-date with traffic incidents as they break throughout the day. The information covers unplanned incidents such as accidents and congestion, plus lane closures and other restrictions due to improvement works. Advance notice of future essential roadworks is given wherever possible. A new feature. This option provides a view of the traffic flow on any of the Motorways in England. The user can then tap a ‘view’ button to review the motorway junction to junction information in detail. The user can share information about any event of interest using the social media options on their phone. This allows the user to search and view any of the CCTV’s on the Highways England Network. A current still image is shown, the image can be updated after 1 minute. The user can now input a route using location name, address or postcodes. This feature uses the Google route finder to identify the available routes and the route will be displayed on a Google Map. Notifications can be added for chosen routes. The review screen enables the user, when not driving, to review the status of a route. They can scroll the list of events or they can zoom the map in or out. The user can drive with or without a planned route. 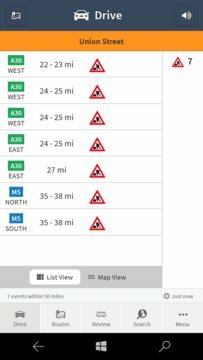 When driving without a planned route the user will be informed about all the Highways England events on the roads around them. The most common approach is to drive with a route. Then the App will only show the known events on the Highways England roads along that route. Your phone must be connected to the internet (mobile 3G/4G/GPRS or wireless) to access live traffic information. To use the location based features of the app, you must have a GPS enabled phone. Having access to the internet can greatly improve the accuracy and the time taken to get an accurate position. It can take several minutes in some conditions for your device to determine your position. If you are experiencing persistent location issues please contact our support team. The app does not currently support bluetooth speakers or hands free kits. We'd welcome your feedback about this app and how we can improve it, so please contact us on 0300 123 5000 and let us know what you think. Highways England is responsible for managing, maintaining and modernising England's motorways and major A roads. It is a government-owned company. We manage, maintain and modernise England's motorways and trunk roads in the interests of customers.